In his first start since December 14th, rookie Tyler Beskorowany notched his first AHL shutout in a 25 save performance. Texas stretched their current point streak to 7 games and are now just one point behind the San Antonio Rampage for 1st place in the West Division. The Stars got out a quick start in the second game of the back-to-back. Just 57 seconds in, Brad Lukowich found Travis Morin on an outlet pass. Morin took a shot and Fabian Brunnstrom collected the rebound for his third goal in as many games. Tyler Beskorowany was shelled in the first period, stopping all 14 Heat shots. Texas, meanwhile, managed 5 in the period but still collected two goals. The Stars second goal of the night came on only their 4th shot with Ray Sawada deflecting a shot from Philip Larsen for a power play goal just before the 12 minute mark of the period. Travis Morin collected the second assist on the tally. Beskorowany got a chance to sit back in the second as Texas outshot Abbotsford 14-4 in the middle frame. Unlike the first period however, the Stars could not pierce the Heat goaltender, Leland Irving, in the period. Despite three power play, Texas came out of the second period with their same 2-0 lead as the first intermission. It turns out that would be all they needed. Mathieu Tousignant added an empty net tally with seven seconds to go. Fortunately and unfortunately, Texas is now idle until Friday's match against the San Antonio Rampage, which will be one of those "four point games", if you will. The Rampage have quite a few games this week (Sat, Sun, and Wed) and are already banged up (Beaudoin) and called up (MacLean, Ekman-Larsson). 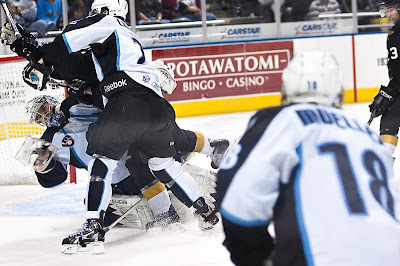 Of course, those games also give the Rampage, as well as the Rivermen and Admirals, a chance to catch up with Texas. My goodness, folks. I guess I should go on vacation more often. Texas has been catching up on games played recently and their play has finally been rewarded in the standings. Texas sits in 2nd place in the division, only 3 points behind the Rampage, who have occupied the top spot since the season started. With last night's win against the Heat, Texas extended its point streak to six games (4-0-1-1). Despite 10 of 18 skaters gaining points, Francis Wathier and Ray Sawada snapped six and three game scoring streaks, respectively. All of the North Division teams are intimately aware of the peril that their Division faces when it comes to the playoffs. Grand Rapids coach Curt Fraser has basically assumed that you have to make it to third place to make the playoffs in the North. With the West Division's strength, it is likely that the 5th place team will jump to the North and takeover the 4th place spot. The Heat currently sit in that outside-looking-in 4th place spot in the North. For Abbotsford, it's been goal-scoring drought that's dropped them out of playoff contention. The Heat have scored the second-fewest goals per game in the league (2.29) and have only scored 24 goals in their past 16 games. In a brief – but scathing – post-game indictment, Heat head coach Jim Playfair said his team wasn't mature enough to come back from the Christmas break ready to play. "You don't get offence unless you pay the price to go to the net," Playfair said. "The guys on our team aren't. They're scared to go to the net. It's simple." "Dumb, lazy minor penalties, casual play from our rookies," Playfair vented afterward. "Simple." Coach Playfair is clearly trying to send a message to his players through the media. Texas will have to hope that the Heat take one more game to get the message. By my estimation, all four lines scored for the Stars tonight and that's good news. Heck, even goaltender Richard Bachman got into the mix with a secondary assist on the 4th tally. In all, ten of the Stars' 18 skaters tallied a point in the game with no skater achieving a multipoint game. Bachman stopped 38 of 39 shots against, losing the shutout bid in the last 10 minutes of game with a power play goal against. Texas faces Abbotsford again tomorrow night. Aaron Gagnon returned from Dallas in time for tonight's game as well and had an assist. Tom Wandell is on the mend, possibly, so the Dallas Stars called up Aaron Gagnon as insurance for tomorrow's game against Nashville. Gagnon has picked up two assists in his five games with Dallas this year and this will be his 3rd callup. After Saturday's deflating loss, Texas had a chance take a solid playoff spot with tonight's game. The Stars 4-3 win this evening leapfrogged them over Milwaukee and set them up to go to the Christmas break in 3rd place. The Stars had set a goal of being in a playoff position after this last 4 game stretch. "We like to break the season into mini-segments like that," said Coach Gulutzan. "And we accomplished our goal [for this segment] tonight." Texas had a heck of a first period, exactly the way the team would want to start the game coming off the loss to Hamilton. Aaron Gagnon scored his second in as many games on a fat rebound off Jeff Deslauriers' left pad. The initial shot came from Francis Wathier, and Cody Chupp collected the secondary assist. The period was a stark contrast to this weekend's contests in terms of penalties. Twelve minutes were handed out in the first, creating 4 power plays for OKC and 2 for Texas. With Trevor Ludwig in the box for slashing, Jeff Deslauriers stopped a puck in his own zone at the right wing circle and hesitated a little too long in figuring out what to do with it. He fed it directly to the tape of Colton Sceviour who potted the "easiest goal he's ever scored", according to the winger. It was his fifth of the year. Francis Wathier kept things going for the Stars in the second. With Texas on yet another PP, Rallo's point shot was tipped by the left winger in front of the net to make it 3-0. OKC got it back shortly thereafter on their own power play, scoring in a similar fashion, Chris McDonald tipping a Shawn Belle shot. Texas ended the period 3-1 and outshooting the Barons 18-11. Scoring heated up even more in the third period as Texas's final period blue continued to haunt them. OKC scores on a garbage collection goal from Greg Stewart 2:35 into the period. Texas seemed to have the edge when Maxime Fortunus blasted a pointshot that was tipped in front by Ray Sawada to make it 4-2. The power play goal looked to have salted away the evening, but more power plays were coming. Shawn Belle made short work of a Barons power play halfway through the period, scoring on a floating wrister from the point just 13 seconds into the power play. Texas looked like it was in trouble. "We've been focused on hunkering down," said Sceviour. "Always having a high guy, making sure we're not turning pucks over, and not feeding into their transition too much." OKC continued to press and eventually pulled their goalie. Coach Gulutzan assured his troops that "it always gets hairy when the goalie is pulled" but stressed to his guys to maintain their composure and continue to play their game. The Stars locked it down to earn Richard Bachman his 11th win of the season. Texas ended the game with a 29-23 shot advantage and held OKC to their lowest shot total of the year. This evening Texas hosts the Oklahoma City Barons in the only AHL action of the night. Just two nights ago, all 30 teams were in action for the first time in AHL history. That night, the Barons' Alexandre Giroux also made some history, scoring his 600th career AHL point. Despite that bright spot, OKC has been on a slide recently. After shooting out of the gate in their first season, the Barons' progress in the standings has slowed. The team is 3-5-0-2 in their last ten and has dropped from first to fifth in the division. The Barons would still make the playoffs despite that fact if they started today because of the weakness in the North Division. That is surely no consolation to the Barons. Oklahoma City had the exact same chance to make a statement as the Stars, facing Hamilton and San Antonio in consecutive nights, just as Texas did this past weekend. Texas managed 3 of a possible 4 points; Oklahoma City gained zero points. Hamilton crushed the Barons' attack 3-0 as OKC went 0/8 on the power play as well. San Antonio scored two in the third period to come away from Cox Convention Center with a 4-2 win. Travis Morin leads all Stars scorers against the Barons with 2 goals and an assist in 3 games. Richard Bachman has both of the Stars wins against OKC and has a 1.66 GAA. Jeff Deslauriers has both OKC losses, and Martin Gerber has the lone win and a 1.00 GAA. Texas built a solid two goal lead through two periods tonight but lost it in the third period, giving up two goals with less than 7 minutes left in the game. It was a tough loss in front of a packed house at the Cedar Park Center. Texas did take the game to overtime, earning one point in the standings. Despite taking 3 of 4 points against the #1 teams in each of the Western Conference divisions, Texas was understandably upset postgame. Maxime Fortunus pointed out that the team has its collective eyes on a prize in April: "We're fighting for the playoffs right now. you might think it's far away, but it isn't." Texas and Hamilton skated to a scoreless first period, but that doesn't mean it was without action. Hamilton led the Stars in shots in the period 13-10. Each team had only one power play in the period as referee Jeff Smith "let 'em play". The power plays were actually both for too many men and at least one of them was called by the linesman. For the record, too many men is the only penalty that a linesman can call. The Stars opened the second period on the right foot. Two minutes and thirty-eight seconds into the period, Travis Morin found the back of the net for his team leading 13th of year. Morin managed the shot reaching his stick across Curtis Sanford to pot a rebound from a Philip Larsen point shot on the wide side of the net. Fabian Brunnstrom had the secondary assist. Texas got a rare power play to end the period for a hook but could not capitalize. The Stars outshot Hamilton 11-8 in the period to tie it at 21 after 40 minutes. Scoring heated up in the third period, as much as it can for two teams with as stellar goaltenders as these two. Texas struck first in the 12th minute of the period. Aaron Gagnon skated in across Curtis Sanford's crease to tip home a Cody Chupp shot from the left wing circle. The goal was Gagnon's 6th of the year and assists went to Chupp and Wathier, his linemates. The Bulldogs roared back thereafter to tie it up at two. J.T. Wyman took his turn first, scoring off a Ben Maxwell faceoff win and going five hole on Richard Bachman. Then on the power play, Dustin Boyd broke in on the left wing side and tapped home a pass from Deshairnais over the outstretched right pad of Bachman. The game would go to overtime to decide the extra standings point. Hamilton's first and only shot of the overtime period beat Bachman to make the final score 3-2. Texas will not see Hamilton again in the regular season at the CPC. The Stars will visit Hamilton for their only other game of the year on March 12th. So where did Texas come apart in this one? The Stars have had recent difficulty in the 3rd period keepign pucks out of their own net. Fortunus pointed to the game plan: "In the games that we've won this year, we've applied our [game plan] for 60 minutes. As soon as you don't apply it, you make mistakes. In this league, those mistakes end up in your net." Ultimately, Texas knows that they had an extra standings point sitting in front of them for the taking. Aaron Gagnon, fresh off his callup from Dallas, echoes Fortunus's sentiments, "It's a tight race. You win one night, you're in. You lose the next night, you're out. Come April, you need anything you can get right now." It was a quick game despite the overtime, ending in 2:17. The last time Texas faced off against the Hamilton Bulldogs it was May 26th. Game 7 of the Western Conference Finals decided who would get the chance at a Calder Cup against the Hershey Bears. Texas emerged victorious that night and now the Bulldogs return to the Cedar Park Center to see the Stars' Western Conference championship banner hanging in the rafters. Don't dream that they have forgotten about it. For Texas, this is their second big game in as many days. The Stars faced the #1 team in the West Division last night and will face the #1 team in the North Division this evening. However, the Bulldogs have not been as dominate as the Rampage. On the whole, the North Division seems weaker than the West. The top 5 teams in the West Division all have at least 36 points, which is how many points the Abbotsford Heat have, the #2 team in the North. Some familar names lead the charge for the Dogs with Deshairnais (8-26-34), Pacioretty (5-16-21) and Maxwell (5-10-15) among active scoring leaders. Last year's goalie of record from the WCF is back as well. Curtis Sanford is 10-5-0 with 1.69 GAA and .939 SV%, ranking him in the top 5 of goalies in the league. He is followed closely by Richard Bachman. Both tenders pitched 3-0 shutouts last night. For Hamilton, Sanford has been sharing the net with rookie Robert Mayer who is 6-4-2, 2.92 GAA and .888 SV%. The Stars seem to have been promoting this game heavily with TV ads during Dallas Stars games, radio advertisements on a large variety of stations, and giveaways on local radio as well. Here's hoping for a great crowd. 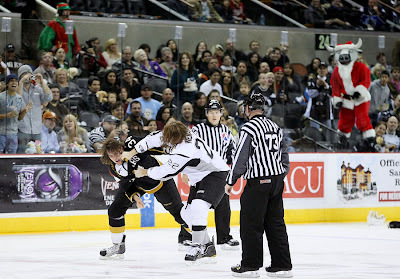 Texas and the San Antonio Rampage last faced each other on December 3rd. Since then San Antonio has won 4 of their 5 games, losing only to the Aeros, a surprise contender in the West. Texas meanwhile has been decimated by callups and eeked out a 3-3-1 record since the last matchup, putting Tyler Beskorowany out in net for 5 of those 7 games. Texas's callups to Dallas are all back for tonight's visit to the Alamo City. Richard Bachman, likely chief among those returning, had previously stacked up a 9-4-1 record with 2.01 GAA and .931 SV%. Also on the roster again is center Aaron Gagnon, who had a successful visit to Dallas. Last year's leading scorer is a bit off his pace from last season (58 points in 78 games compared to 9 in 20), but Texas will surely benefit from his return to the lineup. His return will be especially welcome on special teams, where Texas ranks in the bottom 8 in the league in both PP and PK. For San Antonio, it's all the usual suspects on offense against the Stars. 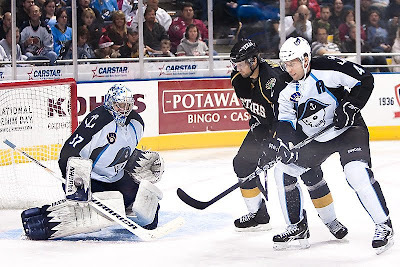 Andrew Ebbett leads the season series with 0-3-0. Goal leaders are Mathieu Beaudoin and Alexandre Picard, both with goals and zero assists. Against the Rampage, Texas forwards Morin and McCulloch lead the charge with 5 and 4 points respectively. No word on McCulloch's return, though it was expected this week. The Rampage have been riding Matt Climie this season, trotting him out in the last 4 games for the club and all 4 games against the Stars. Texas holds a 3-0-0-1 record this season over the West Division's top team. The Stars will hope to continue that mastery tonight in San Antonio despite recent road mediocrity. Those in the building for warmups at Tuesday's game against Manitoba may have noticed Adrien LeMay's goalie mask, which pays homage to Dallas Stars legend Eddie "The Eagle" Belfour. However, unless you had particularly keen eyes or binoculars, you may not have noticed that Belfour's image, number and trademark eagle are accompanied by the Vezina Trophy winner's signature and some good luck wishes for the young LeMay. Five foot ten inch goaltender Adrien LeMay, who has backed up Tyler Beskorowany over the past five games for the Texas Stars, sees a lot of commonality between himself and the Stanley Cup champion netminder. "He's small like me and didn't get drafted either." Belfour, coming in at six foot flat, played college hockey at North Dakota, winning a national championship but going undrafted. Belfour eventually signed with the Blackhawks. LeMay, likewise was also undrafted after playing two years with the Lewiston MAINEiacs of the QMJHL. After a season with the Florida Everblades of the ECHL, LeMay earned a contract with the Texas Stars and has found a home this year with the Allen Americans in the CHL. He is currently 8-1-1 with the club, earning a 2.99 GAA and .905 SV%. Belfour, who played with the Dallas Stars for 5 seasons, just so happened to be enjoying an Allen Americans game this season when LeMay was in net. The Eagle was so inspired by the mask that he met LeMay in the locker room to give a few encouraging words and sign the mask. "He said I was on the right track and to keep working. It doesn't mean if you're a small goalie that you can't get [to the NHL]." Independent goalie scout, Justin Goldman of The Goalie Guild, agrees with LeMay's self-assessment: "Like most goalies at his size, his success stems not only from his overall quickness, but also from a tremendous work ethic, winning attitude and determination both on and off the ice." Goldman also points to reaction speed and lateral movement as key strengths of LeMay's game. Continued work with Stars goaltending coach Mike Valley will improve his skills, but "size is something you can't teach". LeMay knows, however, that Ed Belfour faced the same challenges and seeks defy the odds and one day join the NHL ranks despite his smaller frame. For LeMay, it was a thrill to meet a childhood idol, "When I was young I used to watch him play in the playoffs, and he was really good back then. He's a good role model on the ice for me, [encouraging me] to work hard." And according to the experts, that hard working attitude has the young goalie headed in the right direction. 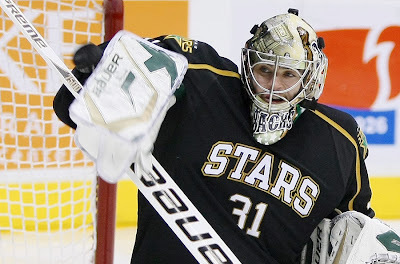 According to ESPN Dallas, Texas Stars goaltender Richard Bachman has been reassigned to the team after an extended stint in the NHL with Dallas. Bachman saw 10 minutes of action at the end of the Phoenix Coyotes game, stopping all four shots that he saw. Starter Kari Lehtonen is a "strong possibility" for Thursday's game against San Jose, an assertion that is bolstered by Bachman's reassignment. Aaron Gagnon will also be returned from Dallas in time for Friday's game against San Antonio. Gagnon had 2 assists in 5 games played with Dallas and a plus-2 rating in an average of 7:56 of ice per game. Both Toby Petersen and Krys Barch look to be fully recovered and ready for Thursday's game. Image credit to Texas Stars/Byrd. The Manitoba Moose visit the Cedar Park Center this evening to close out their West Division road trip that has seen them fall in games against Texas, Oklahoma City, and San Antonio so far. The Stars will hope to continue the trend against the West with a victory over the North division's 6th place team tonight. The Stars and Moose faced off at this exact same day and time last week in a game that sent Texas off through their massive gauntlet of road games. After splitting the road trip at 2-2, Texas returns to hopefully enjoy some home cooking and get a boost from sleeping in their own beds instead of bus seats. Two Texas Stars have been having great streaks despite the road trip. Ray Sawada is currently tied for the league lead with points in 6 straight games dating back to December 4th. Ray's 3 goals and 3 assists aren't all that's perked up in the right winger's play. Over the same stretch, Sawada is plus-4, showing his two-way play is up to snuff as well. Travis Morin is also on a tear as of late with goals in each of his last three games, including the OT game winner in Milwaukee. Speaking of streaks, the Moose are currently on a season-high four game losing streak that stretches back to a 4-0 shutout loss in Manitoba against the Barons. Especially demoralizing for the club are the surrenders of 2-0 and 3-2 leads in San Antonio on Saturday en route to a 5-4 shootout loss. Look for the club to be hungry for a win tonight, perhaps to fault as in San Antonio. No word at this current hour on whether Richard Bachman will be returned for today's game. Dallas plays again on Thursday at home which should give #1 goalie Kari Lehtonen enough time to recover. Bachman may not be returned today, but Stars fans will have to hope that Bachman is returned before the weekend, if not today. "I got the call Sunday night. I was having dinner with my wife, my son and some friends. So I got home pretty excited. I took the plane early on Monday, a 5:45 AM plane. I had to get up at 3 AM so it was pretty interesting. I practiced, warmed up but didn't dress. Getting the call is always a good thing because they're thinking about you. They're rewarding you for playing well." "It's pretty crazy, but that's fun. We're going to play a lot of hockey, so we can't complain. We play hockey for a living, so that's always a good thing. The main thing is to get some rest tonight to rest up for tomorrow. Grand Rapids, Milwaukee, Grand Rapids... that's going to be interesting: a lot of time on the bus. That's where all the guys communicate, spend some time, have a few laughs, and maybe a few card games. Can't complain; it's a good time with the boys." Texas was certainly hoping for a better roadtrip result than .500 but then again, when you look at the circumstances, you really can't be upset with that mark. Texas finished their 4 games in 5 days roadtrip today with a regulation loss to Grand Rapids. Texas started off the scoring in the first period on a Griffins power play. A pass from Greg Rallo found Travis Morin in the slot to make it 1-0 early on a shorty. The goal was Morin's team-leading 12th of the season. Jordie Benn looked to have earned a secondary assist on the play but was not granted one. If the scoring is changed later, it would be his first AHL point. The Griffins had the only goal of the second period as Francis Pare beat Beskorowany off Trevor Ludwig. At the end of the period, Texas was being outshot 27-17 but was holding on at 1 all. Sadly the third period brought a Griffins comeback instead of a Stars resurgence as there was last night. Ray Sawada got the lead for the Stars off a homerun pass from Trevor Ludwig just past the 9 minute mark. The backhand shot for the winger extended Sawada's point streak to six games. He has been on a tear ever since being placed on the line with Sceviour and Tousignant. Additionally, he has been getting some PP time as well. Ninety seconds later, however, the Griffins would counter with former Star Doug Janik beating Besko to tie everything at two. The Griffins would go up for good 3 minutes later when Tomas Tatar tipped a Derek Meech pointshot to make it 3-2. Grand Rapids got an empty netter with 31 seconds left as well. Given the depleted corps of players for the Stars, the rapidity of the games, and the travel involved, going 50% on points in the road trip is astounding. Tyler Beskorowany got the start in all 4 games and saw 159 shots over the 5 days. Texas will rest up and travel back to Austin where they may or may not be joined by Richard Bachman for their Tuesday night battle against Manitoba. 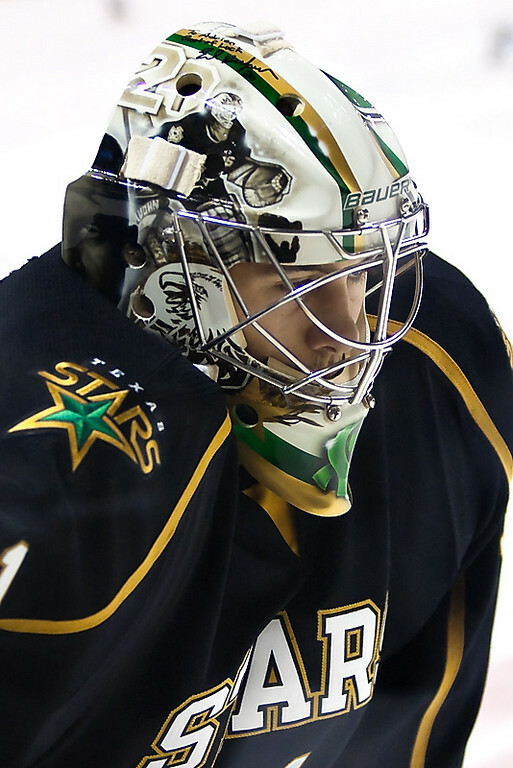 The Stars' ace goalie had his first NHL minutes last night in relief of Andrew Raycroft. The rookie stopped all four shots he saw. Kari Lehtonen's back will dictate whether Texas keeps rolling with Besko and LeMay or gains the rookie out of Colorado College back soon. Dallas and Texas traded defensemen today as Mark Fistric finished his conditioning assignment last night in Milwaukee. Dallas returned Maxime Fortunus to the Texas Stars. Fortunus did not play in any games while in Dallas and is not expected to play today in Grand Rapids. At the end of last night's game in Milwaukee, Admirals coach Lane Lambert got a game misconduct (Rule 39.5 (ii)). He was livid due to the manner in which the Stars OT game winning goal was scored. I'll show you the picture and let you judge for yourself. Morin collected the game winner on a rebound. Special thanks to friend of the blog, Chris Jerina, and his great AHL In Photos blog for snapping the shot. Somewhere in that mass of humanity is Greg Rallo. You can see his socks and skates in the picture but that's about it. Great coverage on the play from Admirals Roundtable, including quotes from coach Lambert. The Stars just faced the Griffins on Friday night, a 4-3 victory. Luckily for Texas, Grand Rapids also had a game on Saturday which means they will both be fighting exhaustion through the game. Grand Rapids travelled to Peoria where they fell to the Rivermen 3-2. With last night's victory in Milwaukee, Texas has finally started making up ground on the West Division. With 5 games in over the past 6 days, the 'games played' number for Texas has finally crept back up to even with the rest of the division, meaning that the Stars superior points percentage actual shows through. For the first time in a while, the division is actually sorted by points percentage as well as points. It's a good thing for the Stars. 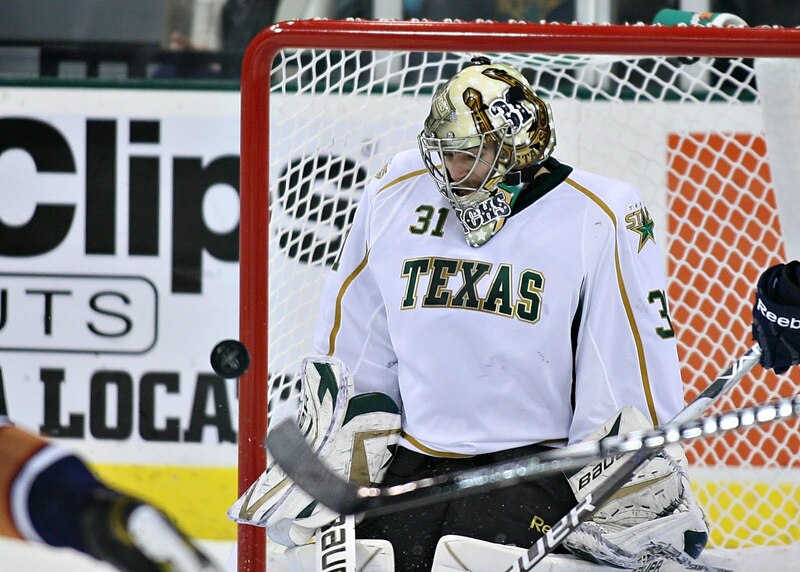 Last time Texas came to Grand Rapids, rookie Tyler Beskorowany deflected 44 of 47 Griffin shots. Last night in Milwaukee he was also a marked man, facing double digit shots in each period en route to a 34 save performance. Now up to the bat is another rookie surely staring down his first AHL start, Adrien LeMay. After facing 83 shots over the past two nights, it would be ludicrous not to give Besko a break. While LeMay has sparkling numbers in terms of wins in the CHL, his GAA and SV% (2.99, .905) are in line with a team that scores more. Texas will need another offensive show without a second or third period recapitulation. By rule, Mark Fistric should have played his last game in Texas last night. The CBA states that a player can only be on a conditioning stint for 3 games or 6 days, whichever is shorter. In 3 games, he finished without a point, minus-1, with 5 shots and 2 penalty minutes. Texas put up one heck of a fight in the Milwaukee to get back into the game. After allowing an early goal, the Stars clawed back in the third period and won it in OT to get the two points. The first period was not particularly kind to the Stars. While they only allowed one goal in the period, they allowed 12 Milwaukee shots before getting one of their own. The period ended 13-5 on shots in Milwaukee's favor but Beskorowany kept it from being much worse. The only goal in the period came at the 2:06 mark with Grant Lewis finding twine on from Kelsey Wilson. The Ads led the way in shots in the second period as well, getting 12 to Texas's 7. Neither the Stars nor the Ads were unable find twine in the period and the game was set at 1-0 after 40 minutes as well. The Stars absolutely shelled Chet Pickard in the third period, getting 18 shots in the first 11 minutes of the frame. They were rewarded with just under 9 minutes left in the period when Colton Sceviour collected a rebound from a Ray Sawada shot to make it 1-1. Two minutes later, Texas quieted the crowd again as Chet Pickard mishandled a clearing attempt and Sean Backman collected the poor clear and deposited it in the back of the net for his 5th of the year. Gabriel Bourque got the crowd back into it with 3:58 to go. Jonathan Blum rocketed a point shot which was tipped in front by Bourque. The goal was scored on what was only Milwaukee's 6th shot of the period, compared to Texas's 19 shots. Texas outshot the Ads in the 3rd 20-10. The game, however, would go to OT. It only took 17 seconds to get the second standings point for Texas. The Stars jammed the crease early in the OT, and with Greg Rallo occupying Chet Pickard, Travis Morin poked home a rebound. It was Morin's team leading 11th goal of the season. The Stars definitely needed a short OT period with the short turnaround to tomorrow's matinee game in Grand Rapids. Now they take the long bus trip back from whence they came at 3 AM this morning. Wathier started the game on the LW of the Morin-Rallo line but then shifted to the Vincour-King line after the starting faceoff. Texas heads to the Bradley center for the first time this season. The Stars visited downtown Milwaukee four times last year, splitting their contests 2-2-0-0. Milwaukee and Texas have played twice in 2010-11, both in Texas, also splitting those games. In each of this season's games, one of the two goaltenders has gotten a shutout. 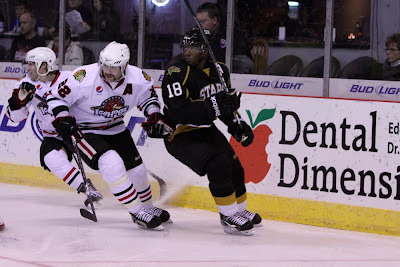 Richard Bachman got his first on a 2-0 win on November 20th while Mark Dekanich took his turn on November 26th in a 1-0 victory. This evening's game is unlikely to feature a goose-egg on either side of the scoresheet. With an injuries to Kari Lehtonen (Dallas) and Pekka Rinne (Nashville), neither will figure in this evening's battle. While Dex's numbers were outstanding, his backups have only played a combined 7 games and most of them have come since the December 3rd call up. Chet Pickard (1-3-1, 2.95 GAA, .895 SV%) and Jeremy Smith (3-3-0, 3.86 GAA, .878 SV%) have allowed 15 goals in four games of work since Dekanich left for the Predators. Meanwhile, Texas is suffering from similar woes, only a little bit for dire. Both of the original goaltenders from the start of year at Texas are out of the lineup (Krahn with an injury and Bachman in Dallas). This has left Tyler Beskorowany and Adrien LeMay to man the pipes. Beskorowany (1-2-0, 4.34 GAA, .886 SV%) just garnered his first win in the AHL last night against Grand Rapids. Meanwhile Adrien LeMay has yet to record a minute of play in the AHL but is 8-1-1 in the CHL this year. Milwaukee has more road wins (9) than they have played homes games total (8), a favor that is repaid by the AHL scheduling carousel at the end of the season. Milwaukee will play 13 of their last 18 games at home. Right now, the team is surely looking to continue their home success (5-1-1-1) to earn important points in the mid-season. The only Admiral to score against the Stars this season is Steve Begin. Last year's top four scorers against the Stars are all elsewhere this season. The same is true for the Stars however. Aaron Gagnon is the only player in the top 5 to dress for Texas this season, but he is currently doing very well in Dallas for the big club. Someone else will have to step up for the Stars in addition to Rallo and Sawada, this year's goal scorers, to keep things going in the right direction for Texas tonight. The Stars needed this game. After losing 8-5 in Rockford, Texas needed to jump back and that they did in the first period. They then capitulated in the second and third to make it close, a trend that they have to hope does not continue in Milwaukee. Texas could be as high as tied for third in the West after tonight's action is completed. Texas came out in the first confidently. Six minutes in, Sean Backman continued his high flying offensive efforts with his 4th of the year. Brad Lukowich and Cody Chupp had the helpers on the first tally of the night. Mathieu Tousignant continued the goal scoring for Texas at 15:23, collecting a rebound from a Morin shot to make it 2-0. Morin, however, would get one of his own 3 minutes later after tipping Severin Blindenbacher's point shot. Texas closed the period up 3-0 but losing the shots battle 16-12. Surely Coach Gulutzan reminded the team of the last time they had a lead after twenty, in which they allowed 5 goals in the second period. The Griffins came back a bit in the second but did not overcome the Stars lead. Greg Rallo got it started in the period with a bad angle shot along the goal line that beat Joey MacDonald to make it 4-0 Texas on the PP. The Griffins got two back in the period though. On another Texas power play, it was rookie Brendan Smith getting his 7th of the year, scoring a shorthanded goal. The shorty was the 3rd against for Texas on the season. The Griffins collected another special teams tally with Jamie Johnson scoring with Texas' Cody Chupp in the box for holding with 84 seconds left in the period. Texas was outshot in the period 13-7 and 29-19 overall to that point. Texas continued to be outshot on the third period, at one point down 11-2 on shots. With 88 seconds left in the game, Mathieu Tousignant took a delay of game penalty to put Grand Rapids on the power play. The Griffins took that opportunity to call a timeout, pull Joey MacDonald, and score their 3rd special teams goal on the evening. With 48 seconds left, Filppula notch the 3rd Grand Rapids goal of the night. Texas managed to shut it down for the rest of the game and emerge with a win. Tyler Beskorowany got absolutely shelled in tonight's game. The rookie had 44 saves on 47 shots, including 18 shots in the third period alone. The Stars absolutely cannot allow that many shots against and expect Beskorowany to stand on his head every night. Commitment to shot blocking is important. Texas will look to rebound from setting some particularly bad records on Wednesday night against Rockford. 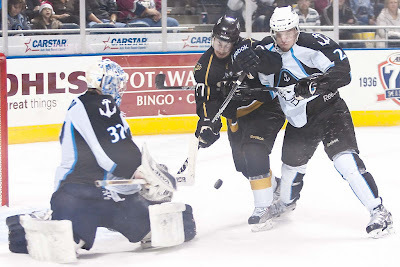 In stark contrast to the Stars' record in Rockford, Texas has only won once in Van Andel Arena: their last contest of 2009-10 in the building, a 5-4 shootout victory. In fact, the Griffins have been dominate over the Stars in their history despite Grand Rapids dwelling at the bottom of the North Division standings. Texas finished the 2009-10 season with a 2-4-0-0 record against the Griffins, going 1-2-0-0 on the road and at home. The Griffins' top scorers from last year (Rissmiller, Jeremy Williams) against the Stars have departed for other teams. Doug Janik, a former Stars prospect, has 1-5-6 in his 5 games against Texas lifetime. Jakub Kindl, who is down from Detroit on a conditioning assignment, was also potent against Texas with 1-3-4 in 5 games. Grand Rapids is celebrating their Wednesday night game over Milwaukee as it snapped a 7 game home losing streak. Overall, the Griffins are 3-6-1-4 at home this season. They have had some trouble this season getting pucks to the net from their forwards, according to Coach Curt Fraser. The Milwaukee game was a good change for the Griffins as they got forward scoring, didn't get outplayed in the second, and played with a lead. The Griffins, indeed, have only won one game when trailing after the first and have yet to manufacture a come from behind victory in the third period. If Texas can get ahead of this team, they stand a chance. Half of last year's goalie tandem remains as Daniel Larsson moved to the Swedish Elite League. Larsson had all of Grand Rapids' wins against the Stars last season. Thomas McCollum (5-8-2, 2.98 GAA, .889 SV%) has taken the lionshare of the load this year with Joey MacDonald earning a month-long callup to Detroit in November. MacDonald (4-2-1, 2.40 GAA, .904 SV%) is back in his starter role now for the Griffins after playing in one game in the NHL for Detroit. Speaking of goaltenders, Texas has a bit of a situation on their hands. With Kari Lehtonen and Brent Krahn both on the mend, Texas is left with Tyler Beskorowany and Adrien LeMay to man the pipes. Beskorowany has not had an easy entry to the AHL, starting in 2 games and allowing 10 goals in 120 minutes of work. The 20 year old was unfortunately hung out to dry in Rockford on Wednesday owing to the lack of a legitimate backup goaltender. If Beskorowany can control his rebounds better against the Griffins, he has a better chance. The defenseman carousel continues for Texas. As Larsen comes down, Fortunus goes up. The Dallas Stars announced on Thursday the club has recalled defenseman Maxime Fortunus from the Texas Stars, Dallas’ primary affiliate in the American Hockey League (AHL). The club also placed center Toby Petersen on injured reserve, retroactive to Dec. 2. Fortunus, 27, has played in 25 games for Texas so far this season, posting seven points (2g, 5a) and eight penalty minutes. He made his NHL debut last season with Dallas, appearing in eight games and accruing four penalty minutes. The La Prairie, QC native, helped Texas reach the Calder Cup Finals in the 2009-10 season, tallying 23 points (11g, 12a) in 72 regular season games during the club’s inaugural season. Petersen, 32, suffered a hand injury Dec. 2 against Washington. He has skated in 24 games so far this season for the Stars, collecting one goal (shorthanded) and one assist with four penalty minutes. The Minneapolis, MN native, set a new career high in goals last season with nine. Petersen has played in 167 games over four seasons with Dallas, recording 31 points (14g, 17a). The 5-10, 197-pound center signed a two-year contract extension with Dallas on April 5, 2010. From a crammed bus 24 miles outside Grand Rapids, Michigan, PxP guy Josh Fisher phoned into "The Adams Theory" on ESPN Austin this afternoon to discuss the Texas Stars. Goaltender Adrien LeMay has been called up to the AHL by the Texas Stars, according to the CHL transactions sheet. 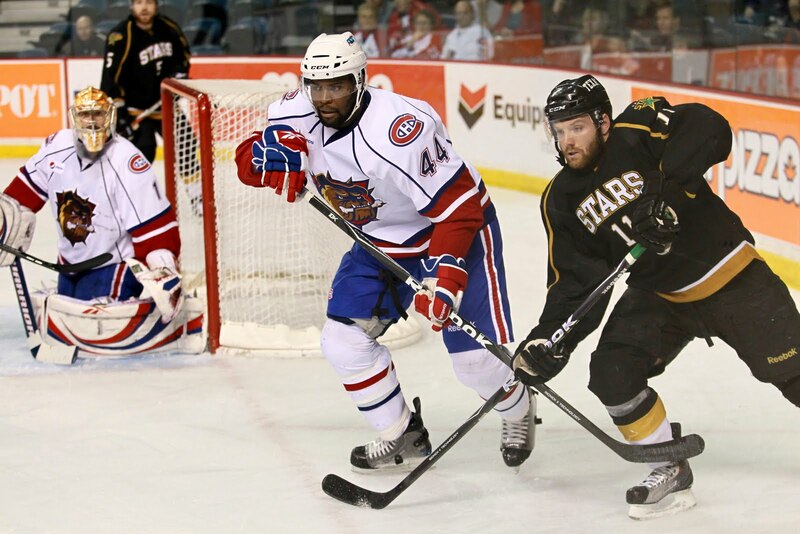 LeMay, who is under contract to Texas, is currently playing in the CHL with the Allen Americans. LeMay is having a pretty great season in the Central League with a 8-1-1 record despite a 2.99 GAA and .905 SV%. His club, the Americans, are the #2 team in the league. LeMay was recently placed on The Goalie Guild list of Top 100 goaltending prospects at #98. This callup surely means that emergency backup Dave Brown from the Quad City Mallards will be released today. Emergency backup Dave Brown has been released from his PTO as a result of the callup. The Dallas Stars announced on Thursday that the club has assigned defenseman Philip Larsen to the Texas Stars, Dallas’ primary development affiliate in the American Hockey League (AHL). The Texas Stars announced that goalie Adrien LeMay has been recalled from the Allen Americans, Texas’ Central Hockey League (CHL) affiliate. Texas also released goalie David Brown from a PTO (professional tryout agreement). Larsen, 21, has skated in three games for Dallas this season, collecting one assist. He has spent the majority of 2010-11 with Texas, playing in 18 games, recording nine assists and four penalty minutes. The Esbjerg, Denmark, native made his NHL debut last season with Dallas, dressing in three games and posting one assist. Adrien LeMay has played 11 games with Allen this year, going 8-2-0 with a 2.99 goals against average and a .905 save percentage. Philip Larsen has been sent back to the Texas Stars to join them in Grand Rapids for this weekend's three-in-three stretch. Larsen has appeared in 3 games for the Dallas Stars this year and 18 for Texas. Larsen has 10 assists between the two league but is still waiting on that first North American goal. The Dallas Stars announced today that the club has assigned defenseman Philip Larsen to the Texas Stars, Dallas’ primary development affiliate in the American Hockey League (AHL). Larsen, 21, has skated in three games for Dallas this season, collecting one assist. He has spent the majority of 2010-11 with Texas, playing in 18 games, recording nine assists and four penalty minutes. The Esbjerg, Sweden, native made his NHL debut last season with Dallas, dressing in two games and posting one assist. The Texas Stars had one heck of a night in a bad way this evening against Rockford. The club allowed the most goals against in franchise history with eight. It just wasn't the Stars' game as they fell to the IceHogs for the first time in the state of Illinois. The first period was all Texas. Just two minutes in, a turnover by Kyle Beach was collected by Ondrej Roman behind the net who passed to Vincour in front for the 1-0 lead. The suddenly hot fourth line collected yet another goal just past the halfway mark of the period. Sean Backman got the puck to an open Luke Gazdic in the high slot where he buried it for the 2-0 lead. Texas ended the period ahead on shots 13-12. The second period, however, was the IceHogs'. Texas got set on their collective heels as they were outshot 15-7 in the period. They scored on a third of them. First, a point shot from Lalonde cut the lead in half. Under 90 seconds later, Hagel collected the game-tying goal just hanging out in the crease. Assists on the goal went to former Stars Vishnevskiy and Garnet Exelby. Texas reared back and opened up another two goal lead in response. With Francis Wathier screening Hannu Toivonen, Dan Spang's point shot found twine to make it 3-2. Two minutes later, Ray Sawada was the benefactor of Colton Sceviour's takeaway as the two broke in to the Rockford zone for the Sawada's 4th of the year. Rockford then rattled off three goals to close the period. Jeff Taffe scored from the low left wing circle at 14:09 to make it 4-3 Texas. Then, in rapid succession, Ryan Potulny and Kyle Hagel scored for the IceHogs. The goals, which were 22 seconds apart, gave Rockford a 5-4 advantage heading into the second intermission. Rockford kept rolling in the third period. LeBlanc collected his first of the year at 7:47 and Bollig his 2nd at 8:25 to make it 7-4. With under 3 minutes to go in the game, Dan Spang gave the Stars some life, scoring his second of the night. Texas pulled Beskorowany for the extra attacker, but a quick faceoff win by the IceHogs led to an empty netter for Rockford. Final score was 8-5. There were a lot of rebounds allowed by Beskorowany that helped to pad the score for Rockford. If the Dallas Stars' leading plus/minus player is minus-1 in the game, then it's just not your game. Texas will re-rack and try again in Grand Rapids on Friday night. The first big league callup for Richard Bachman comes as Kari Lehtonen is suffering from reported "lower body stiffness". Bachman will ride the pine behind Andrew Raycroft in Chicago and Tyler Beskorowany will get the start. It will be Beskororwany's second start in the AHL. No word on the backup for Texas, but one has to assume that it will be a player local to Chicago given the short notice of the callup. David Brown of the Quad City Mallards will be called in to backup Beskorowany. Confirmation from CHL transactions page. According to the always punctual Mark Stepneski, Mark Fistric is on his way to join the Texas Stars in Rockford for tonight's game against the IceHogs. 13.9 Bona Fide Long-Term Injury/Illness Exception Conditioning Loan. A Player who is on the Bona Fide Long-Term Injury/Illness Exception as set forth in Article 50 may, with his consent, during the term of such Bona Fide Long-Term Injury/Illness Exception (but in no event during the first fourteen (14) calendar days and six (6) NHL Games), be Loaned on a Conditioning Loan (the "Bona Fide Long-Term Injury/Illness Exception Conditioning Loan") for a period not to exceed up to the longer of six (6) days and three (3) games, solely for the purpose of determining whether the Player is fit to play. The worst part of this for Stars fans is that last sentence. Fistric may not play in more than 3 games without an extension, which we'll get into if it happens. This means we won't see him at home. Fistric is a strong lockdown D-man who is a great plus/minus player. He'll be a great addition for the Stars over the weekend. Texas got up early this morning after last night's victory in Cedar Park to travel to the state of Illinois to begin a quick but grueling four games in five days road trip. "We're going to play a lot of hockey," said Francis Wathier after the Manitoba game. 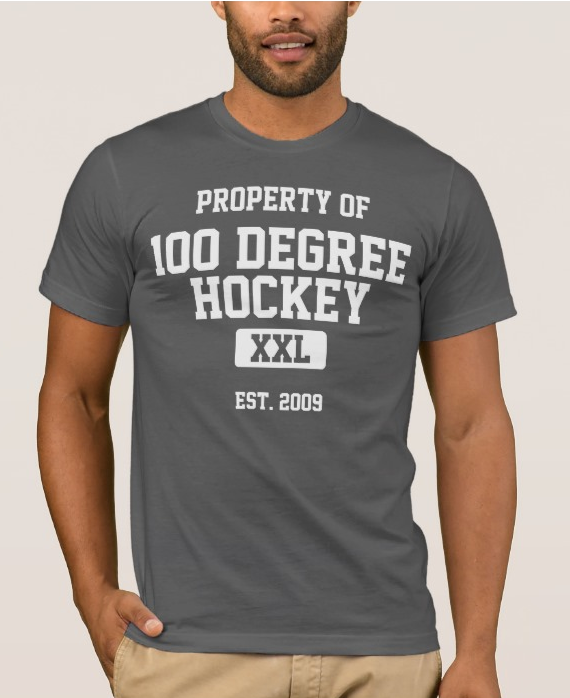 "We play hockey for a living though, so you can't complain." Rockford is not even the same team that Texas played in late October. The IceHogs have only won 5 of their 15 games since last playing the Texas Stars, a game the Stars won 4-3 in the shootout. The IceHogs are currently in last place in the division and tied for last place in the conference. Over their last 10 games, they are 3-5-0-2. Even tonight, they will be missing some of their key pieces to Chicago where the Blackhawks face the Dallas Stars tonight. This evening's game is the second time in a week that Texas and Dallas have faced off against the same AHL/NHL team pairing on the same night, the other being Houston/Minnesota on Saturday. Jeremy Morin (6-3-9, #4 in team scoring) and Rob Klinkhammer (3-6-9, #7) are both with Chicago for tonight's game. The Hogs' leading scorer is defenseman Brian Connelly, who played with Texas Stars Richard Bachman and Scott McCulloch at Colorado College. In nets for the IceHogs, Hannu Toivonen is the familiar name for Stars fans. Gone is Corey Crawford, who is having a boffo season in Chicago backing up/stealing the job from Marty Turco. Splitting time in net with Toivonen is Alec Richards, a rookie out of Yale where he played with Sean Backman. Neither goalie has particularly outstanding stats with Richards at 6-6-1 with 2.65 GAA and .908 SV% and Toivonen at 3-5-2 with 2.94 GAA and .897 SV%. Texas will certainly be looking to kick off their road trip on the right foot with regards to special teams. The Stars have played the fewest road games of any team in the league before tonight and currently hold the worst power play percentage in the league on the road at 8.1%. As they gain opportunities tonight against a Rockford team that averages in the top 5 of PIMs/game, they will hope to score some goals with the man advantage to up the confidence level of the unit. The Stars definitely wanted a big game to send them off for their 4 games in 5 days road trip. Against the Manitoba Moose this evening, they got just such a game. Francis Wathier celebrated his 26th birthday with a goal and an assist in the game. The winger, who started the day with the Dallas Stars in Columbus, hoped to finish the day at home with his wife and "a little glass of wine and maybe some cake, hopefully." Texas came out in the first period with a lot of energy and several great chances but it was the Moose that collected the first goal. Cody Hodgson tallied his team-leading 10th of the season six minutes into the game and started a Moose onslaught. The goaltending of Richard Bachman kept the score at 1-0 but Texas finished the period at an 11-9 shots deficit after leading at the time of the goal by a mark of 6-2. Texas owned the scoring in the 2nd period with birthday boy Francis Wathier starting the party 7 minutes in. Coming in on a counterpunch to a Manitoba chance, Wathier collected a centering pass in the high slot from Ondrej Roman on the left wing. Maxime Fortunus screened out Weiman while the puck crept in five-hole. Only 44 second later Cody Chupp scored on a wraparound on his backhand. The puck got past Weiman on the far side without ever leaving the ice. Assists went to Gazdic and Backman and the Stars were in business. Manitoba would tie it up just before the 12 minute mark of the second period. Evan Oberg snapped a laserbeam of a shot to the top left corner and beat Bachman stickside high. Texas bounced right back in just over two minutes to regain the lead. Sean Backman scored his 3rd goal of the year on a rebound down low on the left wing side. He had all day to make the shot and didn't disappoint with Weiman facedown in the crease. Spang and Wathier collected assists on the tally. The Stars would end the period with a 10-7 shot advantage in the 2nd and 19-18 overall. The period ended without any penalties. Raymond Sawada opened the period on a positive note against his former club with an unassisted marker at the 3:24 mark of the third. On a giveaway from the Manitoba defense, Sawada skated in alone and beat Weiman stickside high for his 3rd of the year. Former Moose Greg Rallo capped it off with seven seconds to go with an empty netter to seal the deal. Texas now looks to the road for a four games in five days stretch. "With the big road trip coming up, to get two points in regulation was big for us," said rookie Sean Backman, who had a goal and an assist in the game. Dallas released this afternoon that Francis Wathier has been returned to the Texas Stars. The Texas Stars have not released his transfer yet so his availability for this evening's game is still unsure. Texas could certainly use him. Photo credit to Brian Hackert. Texas (13-8-1-1, 6th place in the West) finds themselves in a strange position just past the quarter point of the season. Despite holding a 7-2-2 record over their last 11 games , thereby gaining at least a point in 9 of their last 11, they sit in 6th place in the 8 team West Division. A closer analysis of the rankings shows that Texas has at least two games in hand against every team above them in the standings, and they are ranked 5th in the division in points percentage. If we extrapolate all that out to an 80 game season, Texas would make the playoffs, albeit in a convoluted fashion. Texas's division has 8 teams while the North Division has 7. If the 5th place team in the West Division has more points at the end of the season than the 4th place team in the North Division, then the 5th place team jumps over to the North Division and steals the 4th place team's playoff spot. This happened last year in the East Conference. The West Division is very competitive this year and I imagine this situation will be triggered. For the record, Texas has a better points percentage than the #2 team in the North. It's dog-eat-dog in the West, and Texas had a week full of divisional rivalries. Voting for the AHL All-Star game at GIANT Center in Hershey is now open. Each voter has the opportunity to select one forward, defenseman and goalie from each conference to play in the All-Star game. Who are your selections? Tell me about it in the comments. The Texas Stars meet the Manitoba Moose for the first time on the season this evening in Cedar Park. It will be the first of four meetings for the two playoff clubs from a year ago. Each team took their two home games in the series last year, which featured back-to-back games in both locations. Manitoba was knocked out of the 2010 Calder Cup race by the Hamilton Bulldogs in the first round. This year, they are on track to be a contender in the North. Like Texas, the Moose have mostly played intradivision matchups. They have ventured out of their division but only against the West so far. Against the West, the Moose hold a 3-5-0-1 record with two of their three wins coming against last-place Rockford. They come into tonight's game having been shutout against Oklahoma City in Cox Convention Center on Saturday night. Leading the Moose on offense is Sergei Shirokov, the highly touted Canucks draft pick, with 5-11-16 through 23 games. Cody Hodgson leads in goal scoring with 9-6-15. A number of other, including Shirokov, are tied with 5 goals. One time Dallas/Iowa Star Nolan Baumgartner continues to be a steady veteran presence for the club as well with 1-7-8 but a disappointing minus-6 rating. In nets, the Moose return precisely zero of the same netminders from last year. Former Monster Tyler Weiman and rookie Eddie Lack are between the pipes for Manitoba this year. Last year's number one, Cory Schneider, is now the backup in Vancouver while Darren Machesney is in Victoria (ECHL). The AHL veteran Weiman has a 5-3-1 record with a 2.75 GAA and .894 SV%. Rookie Lack, who came over from the Swedish Elite League, is playing his first amateur or pro North American season and doing quite well. Lack is 7-5-2 with a 2.04 GAA and .925 SV%. As far as special teams, Manitoba ranks near the bottom of the league in road power play (#24 at 12.7%) and #11 on road PK (84.4%). Texas will have to play solidly as a team with some of their larger contributors out of town with the parent club. Gagnon, Wathier and Larsen make room for some other folks to step in, including Tristan King, who was called up from Idaho yesterday. Manitoba has also been hit with callups, if it eases your mind at all. Coach Claude Noel commented on it on the "Moose Hockey Show" on the Winnipeg local sports station. With Wathier called up to Dallas, Texas had to call up Tristan King from Idaho. King is 1-3-4 with Idaho in six games. The Dallas Stars announced on Monday that the club has recalled left wing Francis Wathier from the Texas Stars, Dallas’ primary minor league affiliate in the American Hockey League (AHL). 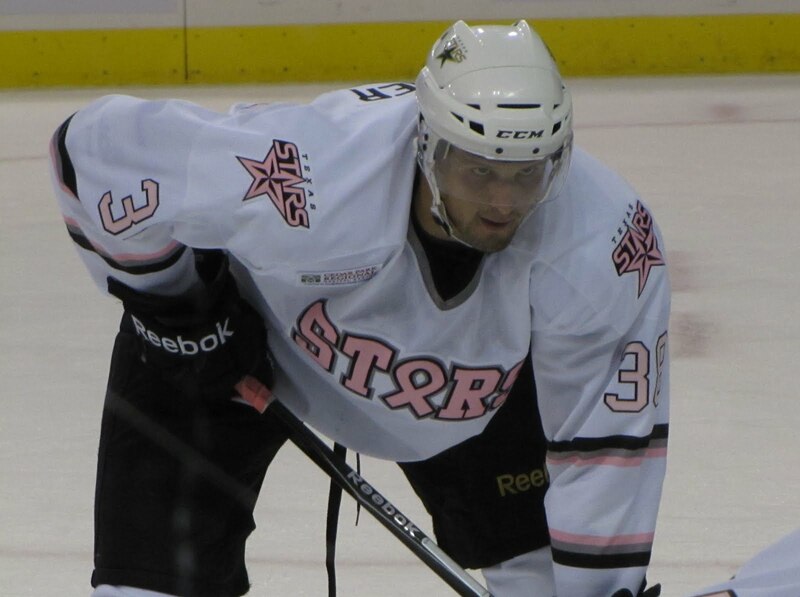 The Texas Stars announced that the club has recalled forward Tristan King from the Idaho Steelheads, Texas’ ECHL Affiliate. Wathier, 25, has played in 23 games for Texas so far this season, ranking second on the team in goals (eight) and tied for third in points (11). In 2009-10, he recorded 40 points (19g, 21a) in 76 games with Texas and helped the Stars reach the Calder Cup Finals in the club’s inaugural season. Wathier also ranked second on the club in penalty minutes during the regular season (101). The St. Isidore, Ontario native made his NHL debut last season with Dallas, appearing in five games and recording five penalty minutes. Wathier was drafted by Dallas in the sixth round (185th overall) at the 2003 NHL Entry Draft. King, a 20-year old rookie, played the first nine games of the season with Texas, scoring twice and setting up two others for four points. He was assigned to Idaho on November, 21. King played in six games for the Steelheads, scoring one goal and three assists for four points. With Barch and Petersen out of the lineup, Dallas called up one more reinforcement in Francis Wathier. Dallas plays tonight in Columbus. Texas is now down to 11 forwards available, which should necessitate the callup of Tristan King from the Idaho Steelheads. Sometimes a team just has your number. You can be good against a good team and sometimes you can be bad against a not so good team. Last year Texas had misfortune against Peoria, a non-playoff team, while lording over the IceHogs, a playoff squad. This year, Texas is having a bit of trouble with the Aeros. The trouble started for the Stars in the first period with Houston scoring the first goal. The first came from Nate Prosser on a goal scored from the point. The puck never left the ground and simply made its way through traffic to beat Bachman on the left side of the net. The power play tally was Prosser's 3rd of the year. Texas was vastly outshot in the first 16-5 and was lucky to come out with only a 1-0 deficit. Houston struck again in the second period off a bad Texas change. Coming off a 4-on-4, Texas got caught with their fourth man changing behind the play. As Houston surged forward, the fifth man coming out of the box jumped into the play, creating a 5-on-3, effectively. Colton Gillies tallied his 3rd of the year on the play. "It was pretty rough at the start of the game," said forward Ray Sawada. "We weren't executing our passes, plays or power play." Texas turned it around after the halfway point of the second, collecting a power play goal from Travis Morin with 3:24 left in the period to cut the lead to 2-1 for the end of the period. Texas came out for the third period on fire and Colton Sceviour scored his third goal of the year falling down. Severin Blindenbacher collected the primary assists, his second of the night. In short order thereafter, Texas coughed up the puck in their own zone and former Star Warren Peters made good on the turnover. The 3-2 score took the air out of the building. The building got set on fire again when Cody Chupp scored his second of the year on a nice centering pass from linemate Sean Backman. The 3-3 tie would persist into overtime. Just 50 seconds into the overtime period, Texas's Fabian Brunnstrom got called in the crease for a high stick. "It was a little bit of a questionable call, especially in overtime," commented Sawada. Houston scored at the end of the power play to seal the deal and gain the extra standings point. Texas had seven power play opportunities in the game and only scored on one of them. Meanwhile, Texas had only three PK opportunities, including the overtime minor, and allowed 2 power play goals against. Special teams, which had been humming at home, need to improve if Texas wants to maintain their success when they head out on the road next week. Lines were mostly unchanged from last night. Tousignant started with Roman and Vincour but then shifted back to his usual lineup spot for the rest of the game.